Garrett graduated from the United States Military Academy in 2008 with a degree in Civil Engineering. Following his commission as an Engineer Officer, Garrett was assigned to the 25th Infantry Division and was stationed predominately in Hawaii. He served six years in the Army with experience in both combat and construction engineering units. 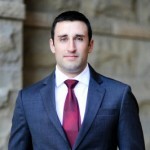 He is currently completing his MBA at The University of Chicago Booth School of Business (class of 2016).